Iranian President Rouhani is an Iranian “moderate”? Illustrative. FEMA/Marty Bahamonde. Iranian President Hassan Rouhani, considered by some in the West as a “moderate,” told the Islamic Unity Conference on Saturday what he really thinks of Israel. 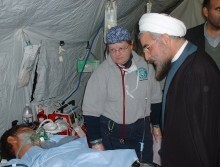 “One of the most important effects of World War II was the formation of a cancerous tumor in the region,” said Rouhani in an English translation of his comments posted to his office’s website. The Arabic version of the website—per a Google translation into English—clarified that Rouhani was describing Israel. Following the surprising public comments, Israel warned the words are more than just empty threats. “History has taught us that anti-Semitic threats from fanatical leaders, and exporters of terror who have hegemonic aspirations, must be taken seriously,” said Israeli Strategic Affairs and Public Diplomacy Minister Gilad Erdan in Germany on Sunday. Erdan, whose comments to the pro-Israel Deutscher Israelkongress conference were published in a press release, encouraged Germany to “take a more aggressive stance against the Iranian regime.” He noted that Iran threatens Europe as well. Indeed, Rouhani didn’t limit his antagonistic comments to Israel in his Saturday speech. The West, and the United States in particular, were targeted as well, and Rouhani even invoked Islam in his anti-West comments. “Submission to America and the West means betraying Islamic ideals and Muslim generations, and laying red carpet for historic criminals,” said Rouhani, according to the Iranian Presidency’s website. The strong comments from Rouhani come as the US has resumed stiff sanctions against Iran, including oil and financial sanctions, after exiting the Iran nuclear deal earlier this year. So far, Europe has resisted in following the American approach. Erdan believes that the US goal of changing the Iranian regime’s actions via the sanctions is important not just for Israel, but Europe as well.